Deep Pink Calla Lily & Pearl Bridal Bouquet. 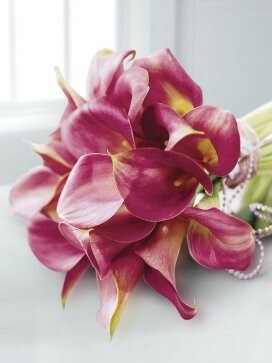 The sheer elegance and beauty the Calla Lily portrays is remarkable, what better choice for bridal bouquet! This outstanding, elegant and graceful bridal bouquet is one that makes a big impression and demands the attention of others! 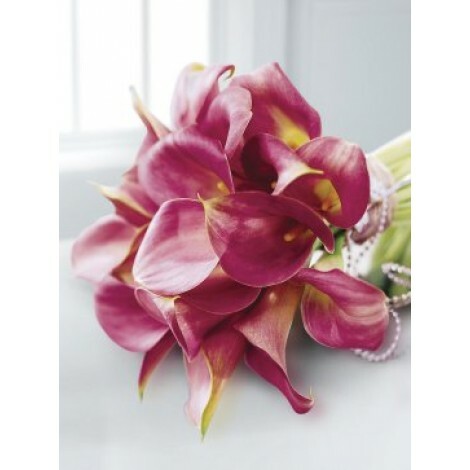 Bold, beautiful and quite simply exquisite the array of simple yet so very effective deep pink Calla lilies are perfectly accessorized with pearl pins and pearl edged ribbon. This exotic, simplistic and stunning bouquet is comprised of; 24, hand-tied, deep pink, mini calla lilies.